It is crude, callous but in trying to whip up suspense, it loses sight of vulnerability. There is a thin line between making a film about a serial killer and glorifying his actions. With “Raman Raghav 2.0”, Anurag Kashyap seems to be unsure which side of the line he’s standing on. A sociopathic killer and a damaged cop face off in this Indian thriller that does a surprisingly deep dive into lust, murder and violent obsession. With so much to offer, Raman Raghav 2.0 is quite a watch. It is worth the money as the mysterious mind of Raman Raghav unwinds. Anurag Kashyap delivers a gritty, grimy, gut-wrenching story of opposites in order to tell you that they're not really so. Raman Raghav 2.0 is another triumph for Anurag Kashyap. It sure is not a Gangs of Wasseypur, but the filmmaker knows what to do with his viewers. This one's certainly not a date film. But hey, a jolty squeeze on the upper arm can do much for your love life. It’s hard to imagine what Raman Raghav 2.0 could have been had it been made by a different director. Nawaz, Vicky Make A Chilling Statement On Pure Evil! The trailer was eerie, spine chilling and left us wanting for more but the film fails to hold your interest. After a few more cold-blooded murders, including those of his own sister, brother-in-law and nephew, the police once again nab him but he gives them the slip again. It isn't an easy film to watch although much of the violence that it depicts is kept off-screen. But the deft manner in which it uses the cinematic resources at its disposal – which, of course, is influenced in part by the film's limited budget – makes it an immersive cinematic experience. You see, they both kill for pleasure. No, make that one for pleasure. The other for furious vindication for crimes committed against his self worth. It is dark, very dark and deprived of even a shred of dignity. It makes you feel nauseated at the shocking spread of depravity served to you. But then again, it is unique storytelling. Go for it, if you have the suitable palate. 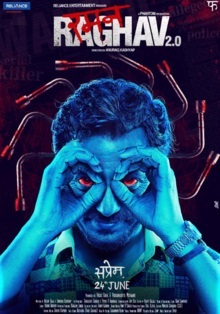 On the whole, though RAMAN RAGHAV 2.0 promises to be an edgy thriller, the film fails to deliver. It is only Nawazuddin’s brilliant performance that helps you sit through this 140 mins long film. There is real good cinema in that scene towards the end of the film, and also a reminder that Kashyap has a lot of talent. He just needs to stop making films that are very similar. If you are a normal human being with normal emotions and sensibilities, stay away from this one by miles. Nawazuddin & Vicky Can Scare The Living Hell Out Of You!